Are you looking to relocate to a new city? Have you considered Cleveland, Ohio? While Cleveland may be much smaller than other popular American cities, it has many desirable qualities to offer its residents and visitors, alike. After one visit, you may come to find that it is the perfect place to call home. Whether you want to vacation in Cleveland or make it your permanent home, National Dispatch offers a variety of car shipping services to make your life easier. In a move, some choose to just drive to their destination. However, car shipping is a safer, easier, and faster alternative to driving. Below, you will find some car shipping services that might come in handy when moving your car to another location. This method of transport is the most popular way to ship your vehicle. If you choose open auto transport, your car will be loaded onto an open-air carrier. These types of carriers can typically carry either six or nine cars at once. Due to the construction of the carrier, your car will be exposed to road elements, as well as the weather. Enclosed auto transport shields your car from all external elements. This would include road elements, such as dust, dirt, and grime in addition to weather like snow, ice, rain, and hail. This shipping method is highly recommended for individuals intending on shipping a high value vehicle, such as a classic, sport, or exotic car. With door-to-door auto transport, the driver will come directly to your home or place of business to pick up and deliver the vehicle. In comparison to the alternative of driving to a terminal, this option is much more convenient. All the hard work is done for you. Learn more about Door-To-Door Auto Transport. If you own an inoperable car, it can be difficult to find an auto transport company that is capable and willing to haul your vehicle where it needs to go. Have no worries. National Dispatch has the means necessary to transport your non-running car anywhere in the United States. Learn more about Non-Running Car Transport. Cleveland, located on the shores of Lake Erie, is home to over 300,000 people. The Greater Cleveland area, which includes all the suburbs surrounding the city, has a population of over 2 million people. 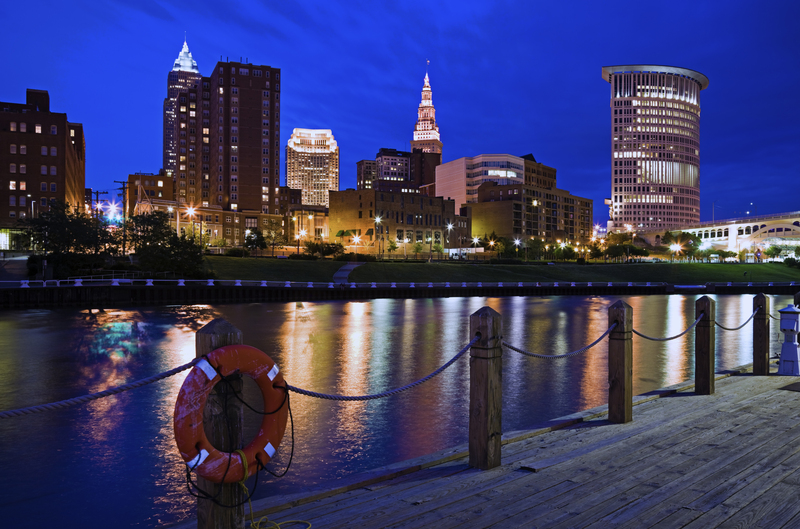 Cleveland is the ideal place for families, business professionals, college students, and more. Here are a few reasons why you might want to consider moving to Cleveland. Cleveland has a low cost of living, lower than that of the national average. This makes the city a much more affordable option in comparison to other cities, such as Los Angeles or New York. However, it is important to keep in mind that this will vary by neighborhood. Do your research to find a neighborhood that you love with houses that fall within your budget. Within the city, you will find many different school districts. If your children are K-12, take the time to research which district will be right for you and your family’s needs. There are plenty of options available to you, so there is no reason why your child cannot get a quality education. There are also many higher education options in the city, such as Cleveland Institute of Art, Cleveland State University, Case Western Reserve University, and more. You will never be bored in a city with so much to do. There are plenty of family-friendly options, as well as single activities. Visit the Cleveland Metroparks Zoo to see animals from a variety of species. The zoo is home to one of the largest collections of primates. If you love watching musical performances, then the Cleveland Orchestra might be the place for you. On the other hand, if you love art, then you will want to check out the Cleveland Museum of Art and all its exhibits. Learn more about moving to Cleveland by reading our Auto Transport Services: Ohio. You have decided that you want to make Cleveland your permanent home, and you are going to use car shipping to get your car where it needs to go. If this is your first time shipping a car, we have some car shipping tips to keep in mind. Book ahead of time. It is important to book auto transport services ahead of time. This will ensure that you get the services that you want. It will also allow plenty of time for the auto shipper to get things in order and for you to get your car ready for transport. Protect your car. If you are the owner of a classic, luxury, or exotic vehicle, you might want to request an enclosed carrier to protect your car from the elements. An alternative to enclosed auto transport would be to request top loading on an open carrier. This means that your car will be loaded on the top level of a two-level carrier, reducing the chances of any encounters with dust, dirt, grime, and other elements. Take everything out of the car. Prior to auto transport, everything should be removed from the car. This is for safety purposes. We do not want your items to become damaged or your car to be damaged as a result of these items. Inspect your car. A formal inspection will be conducted when the driver arrives to pick up your vehicle. However, it is also recommended that you perform an inspection of your own. Look for any cosmetic damages, such as dents, scratches, or paint chips. These can be documented with photos. Also, note any mechanical issues. National Dispatch is a leading provider of auto transport services. If you are in need of car shipping services to Cleveland or anywhere in the United States, contact us today. Request a free, instant car shipping quote using our online quote calculator. No personal information is required. You can also call us at 800-321-2051.